The idea of penguins being the center of atttention is getting old these days. The dismal box-office return and negative critical reviews of “Mr. Popper’s Penguins” is evidence of that. Although, while its not the last film to nail in the coffin of this antartic animal fad, “Happy Feet Two” is more likely the source of this dying trend in penguin films. Being one who likes animals, I have nothing against penguins. But since the massive audience appeal that began with “Happy Feet,” things began to get straining as we went from dancing penguins to surfing penguins with many studios cashing in on this idea. To sum up my thoughts of this trend and the movie, think back to a gag in the Simpsons Movie when Homer is playing “Grand Theft Walrus” and in the game shoots a penguin that tap dances. That joke alone greatly sums up how the public felt when it came to this sequel to a movie many enjoyed. We return to Antartica, to find that Mumbles (reprised by Elijah Wood) is a father to a kid penguin named Erik. While the emporer penguins have adapted the way of song and dance, little Erik unfortunatly can’t seem to tap dance as good as his father. Ramon (Robin Williams who also plays the “love penguin” Lovelace) also finds things have changed in his commute when he finds his flock have accepted a Swedish accented puffin named Sven (voiced by Hank Azaria) who is mistaken for being the only penguin in the area that can fly. Erik sees this grand marvel and believes that maybe doing air travel is more interesting than learning to dance. However, there is trouble afoot as a massive iceburg closes in on the emporer penguin’s territory entrapping them in a massive bowl with no possible escape. This leads to some interesting questions of how one would get out or survive, but all the time I kept asking did the writers see Ice Age: The Meltdown and Chicken Run. With the idea of a massive community trapped in an enclosed space and a bird that says all kinds can fly, its leads one to question what was the scripting process like. 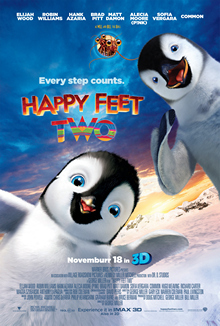 “Happy Feet Two” suffers from having one plotline too many and that is probably the biggest problem I have with this sequel. As one story layers after another, I kept thinking how far to do you have to make a story complex in order for it to be entertaining. It feels like it all started with a simple idea to make a story about a little penguin that can’t dance like his pop and then gradually expanded as one made another script after another proposing a possible storyline. In the final run, it feels like all these ideas were crammed in as opposed to making seperate movies for each one. Even a running gag involving two small krill that try to find a place in the universe would have been more suited as a sepearete picture (even thought I will admit, they had a better fleshed out storyline then everything else tossed in). And when you have the feeling that one plot line is more developed than everything else, you know something is wrong. At times, its feels like more effort was placed in the visual work and staging in musical numbers, which to its credit are impressive with the exception of the “Under Pressure” finale being a big highlight. But something doesn’t seem to be adding up here. The characters are ok, the songs and computer effects are good as the original, but what is missing is the heart. The first film delt with prejudicy in a decent way, and while placing an environmental message that felt somewhat forced, everything worked out fine as the acceptance of a character of different quality was the center of the film. Its sequel has no center to focus on and just feels like cutaway scenes from the video game woven together to make a feature film. The penguins may look cute and innocient, but the sequel as a whole makes me want to recommend my viewers to watch “Fraggle Rock” to show how to do a subtext about working together and bring communities of different races together no matter how big or small. There is a lot more you can get out of from a 96 episode series than a movie that crams too much in like a tight can of tuna with little air to breath. The marketing for “Water for Elephants” was something that I feel was done wrong. The vibe I got from it was a “happy-go-luck” tale about lovers trying to run a circus. What shut me off from it was how I didn’t feel there was anything interesting or anything that gave me a reason to view it. By the time I decided to give it a look, I found myself to be wrong about it. Set druing the Great Depression, the story centers around Jacob (Robert Pattenson), a college student that comes close to getting a degree and future as a veteranian. However, things backfire when his parents die and is left with nothing. He later joins a circus and becomes well-aquainted with the local carnies. Eventually, he gets hired on by the circus owner August (Christoph Waltz) who later gains an elephant as the star attraction to replace a broken down horse. As things progress, Jacob becomes concerned with the relationship between August and his wife that comes off as complicated as August tends to be easily jealous and very possessive of his things. The character of Jacob is based from the classic love story formuals of the outsider that comes into the lives of two people and falls in love with the one aquainted with another. However, this plot element is rather unique as the love interest is bound to the cirus owner. The relationship between her and August is a tragic one. August can be seen as a softer side of Frank Booth from Blue Velvet. Instead of cussing every minute and inhaling gases, he is a rough character that only wants things his way and the more cross you with him, the bigger the chance he will toss you off a train. While Jacob is an innoicent guy, at least he knows the right way of things seeing how August tends to misabuse the animals and sees his own crew as just acts rather than people. Water for Elephants as a whole is not just a love story. While watching it, I had a strange feeling as I felt like I traveled back to a time when I saw the circus as a kid and appreciated all the acts I saw. A time where the will of imagination was just under a big top. However, the circus experiences I had were indoors (with one exception of seeing it under a tent) as opposed to the dying tradition of the “big top circus.” This movie provides that feel of seeing what one was like in the past while getting a good look at the attraction in the center ring. A look of what audiences in the 1930s didn’t see behind the drama that occured behind the tents. Another winner of the night was Martin Scorsese’s latest critical hit, Hugo. The story of a kid that lives in a 1931 train station after his father dies and continues to manage the clocks under the unknown eye of the train station inspector (Sacha Baron Cohen). In Hugo’s possesion is an automaton, a wind-up machine that can either write or draw pictures. Thanks to the unforunate death of his father, the discovered creation is left unfinished as Hugo tries to fix up and learn the possible message his father left behind. Also involved is a nearby toymaker that is aware of Hugo’s michef and makes his work for him to pay off the items he “stole.” Hugo later comes across the tinker’s goddaughter who could be a possible key in fixing the automaton. Once the secret is unlocked, the second half becomes more of an homage to film pinoeer George Méliès as Hugo and his new found friend try to find the conncetion between the automaton and the tinker. In fact, one can notice this movie tends to apply the basic cliches of a silent movie off the bat as visual expresion is often used, certain shots are mostly wide or long, and certain characters have certain quirks that apply to them like the inspectior being a vicim various chases that result in a comical payoff. Even the world of Hugo is visually impressive and becomes a character itself as passengers come and go like how the moving gears of clock never end or how the bright and vibrant the train station is compared to the dark and dimmly lit rooms of the clock. Hugo in its own right is more than a movie about a boy and his ventures. Its the rediscovery of the past and power of films. Without the character of Hugo, there is no charm and innocence that leads to the ingenious spark as he gets an old figure to relive his past while it wittles down to a finale that pays ode to various and iconic silent film scenes. To describe how impressive this movie is tends to be a difficult one. It has a unique charm and appeal that reminds us of the magic of movies and what they can do. Its intersting how one Suess movie can go a long way. Last weekend, audiences were introduced to another big-screen adaptation from the work of Theodore Gissel, The Lorax. The story of a small orange creature (voiced by Danny DeVito) that tries to save the forrest it protects from being cut down is so far highly noted for being the first blockbuster gross of the year so far. In just one weekend alone, the creature that “speaks for the trees” was heard as it grossed $70 million, as well as gaining back its production budget. While critics were mixed about the environmental message and questiong of how its marketing with Mazda was contridicting the moral message the flick carried, it was no doubt a hit with viewers and a good sign that 2012 will be quite promising this year. Lightening stuck again this week as The Lorax took first place with a gross of $39 million and taking the #1 spot again. However, while there is a hit, there is a flop. In the case of John Carter, the sci-fi story of a Civil War soilder that becomes a rebel on Mars, was predicted to be a disapointment at the box office. And no surprise, it was. The heavily panned Disney flick grossed in a mere $30 million, which is a not a very good figure for a $250 million budgeted flick. Even the midnight showings presented a sign as it took in a dismal $500,000. Many factors are to blame for this bombing as most critics are pointing the finger at the marketing department. Either way, its not only a blow to the “House of Mouse” but a personal one to director Andrew Stanton. Better known for his work at PIXAR with Finding Nemo and Wall-E, this was his first live-action venture and its unknown if this could be his last.